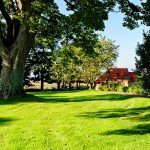 Who does not want an enviable landscaped yard? 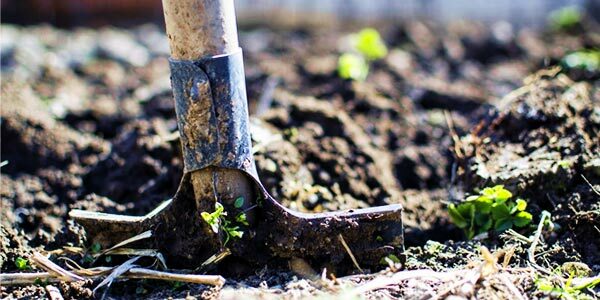 As a first step, you will need to clean up your yard of unwanted grass to get an uncluttered, neat look. To accomplish this task there are numerous weed killers and weed trimmers available in the market. You may choose any based on your requirements, convenience and functionality. 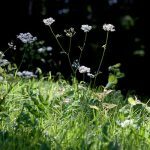 1 What is a Weed Trimmer and Why Use it? 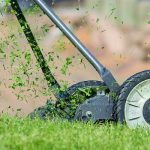 What is a Weed Trimmer and Why Use it? A weed whacker or a weed eater is a tool that helps clear unwanted plants and other botanical growth around the trees. Many string weed trimmers use a monofilament line to cut unnecessary grasses and other plants near the ground or on a rugged terrain. The tool consists of a handle at the end of a long shaft and a cutting tip at the base of it. George Ballas conceptualized the brand name “weed eater” in the early 1970s. The revolving cleaning bristles in an automatic car wash inspired Mr. Ballas. He ended up inventing the weed eater by attaching pieces of fishing line to a popcorn can that was fastened to a lawn edger. They are available in either manual range or motorized ones. In its basic form, it is standard spade with a flat edge. The blade has a semicircular shape and is attached to a long handle. A flat edge on the other end of the blade gives you consistent depth while digging the spade in the soil. It also helps you to apply a greater force with your foot to remove the stubborn roots. You may use a grinder to maintain sharpness of the blade. Roller based trimmers have rotating steel blades or teethed wheels for cutting grass. They look similar to a turbine. The rotating blades are attached to the axle at the base of two vertical shafts. A pair of wheels allows movement on the hard concrete side of the lawn. The wheels rotate as you push the trimmer. The energy generated due to the wheel rotation moves the steel blades that cut through the grass along the edge. Used to trim weeds and unwanted plants where other weed trimmers are unable to reach safely. 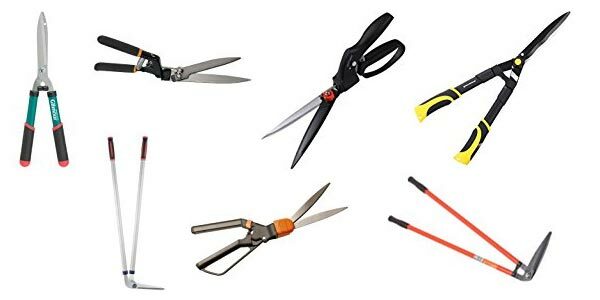 Many grass shears have adjustable handles. They allow you to trim around trees and shrubs without damaging the bark. 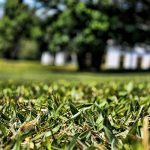 If you have a large lawn, you may opt for string trimmers. 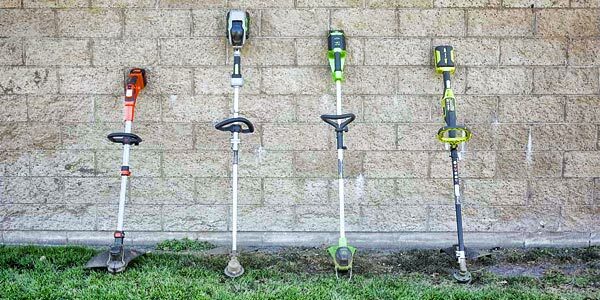 String trimmers are categorized into three types. They are most powerful and versatile among the three types of string trimmers. Starting the gasoline operated string trimmers is very easy. All you have to do is pull the cord and the trimmer is in action. Gasoline operated string trimmers can handle a variety of weeds in and around your yard. They are easy to use and comfortable to hold during operation. It is easier to perform a job that requires more than thirty minutes. 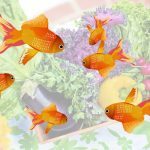 They work well on tough plants and unwanted botanical growth by making it easier for you to pull them out from their roots. The gasoline-operated trimmers come with a high price tag. However, their longevity supports their steep pricing. The downside of gas trimmers is that they are loud, heavy and emit fumes. They also require regular maintenance. Gasoline engines can be noisy with high emissions. 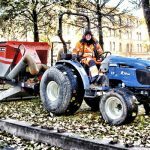 Since the exhaust is situated right behind the motor close to your body, it becomes necessary to wear eye and ear protection while working with this type of grass trimmer. The gas trimmers have a rotating disc at the base. The disc spins the string at a very high speed, which cuts the unwanted foliage. The trimmer is designed to run for long hours. Some trimmers come with an electric start adapter while others have a rotating head that swivels to a vertical position for easier adjustment. You may use a dry brush to clean the clippings after use. Don’t use water or other cleaners. Make sure to empty the gasoline tank and run it dry after every season. Change the spark plug every 2-3 years to ensure a seamless operation. The gasoline tank requires a combination of gas and oil in a preset ratio. Ensure you use the correct ratio. 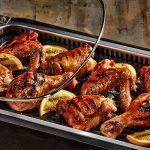 They are an inexpensive option when compared to their gasoline-operated counterpart. They are free of emissions and do not require any maintenance. 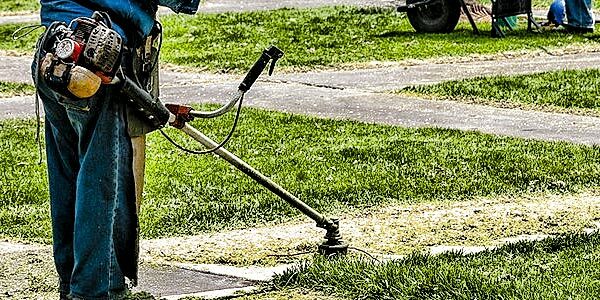 Priced in a range of $70-$120, corded electric trimmers work best for edging, trimming small grass, and tall weeds. 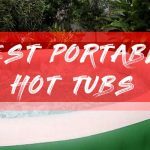 They are lightweight making them portable and easy to use. However, it is difficult to maneuver them owing to the corded design. The length of the cord decides how much area it can cover. Hence, they are not at all suitable for a large yard or lawn. 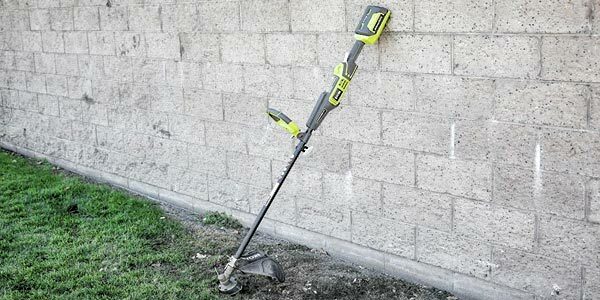 These are heavier cordless trimmers and are suitable for edging and trimming of tall grasses and weeds. Battery operated trimmers are devoid of any emissions and do not punch a hole in your pocket as they are maintenance free. Steeply priced in a range of $100-$300 they have almost similar features like that of gasoline-operated trimmers. In some models, you have the option to adjust the height for a comfortable grip and to prevent hunching. The negative aspect of battery-operated trimmers is that they require recharging every 30 minutes. Each recharge takes about an hour. The batteries last half as much compared to one tank in a gasoline engine. With 3-5 years of longevity and batteries priced at $100-$150, you end up paying a premium for these models. The string trimmers can have a straight or curved shaft. Straight shaft models are expensive and ideal for taller people. Curved shaft, on the other hand, is meant for smaller jobs. Avoid going for a model that has a gap between the cutting blades and the gear lock. Tall grasses have a tendency to wind up on the gap and a bunch will cause the motor to jam. 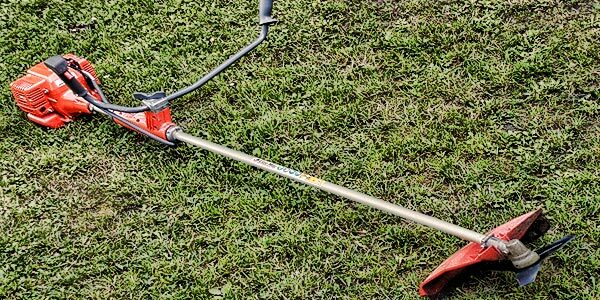 The string size is significant when it comes to choosing string trimmers. The string size is what decides the cutting prowess. Trimmers with two strings can handle unwanted heavy weed growth compared to their single line models. A bumpy liner string immediately releases the line from the spool as you bump the head of the trimmers on a surface. Change the cutting string at the end of every grass-cutting season to make sure the old withered string does not break easily. Stay away from buying cheaper strings as they are prone to damage. 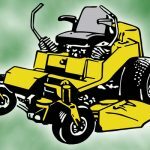 Check out the manufacturer manual to decide which string size is best for your motorized trimmer. There is yet another type of grass trimmer available in the market. They are brush cutters that use a blade instead of a string. Brush cutters are inconvenient for a large yard. 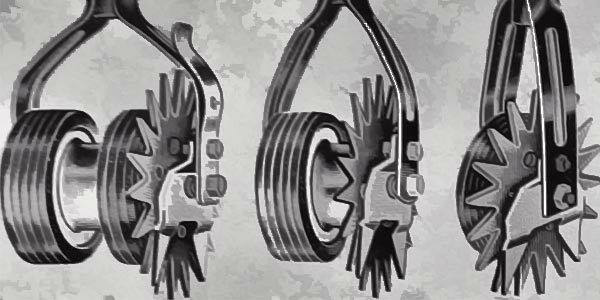 They usually come with a large shaft and anti-vibration features to reduce the fatigue caused by its long operation. However, with proper maintenance and usage, the brush cutters have a greater longevity compared to string trimmers. Sharpen the blade frequently if it becomes dull after every grass-cutting season. Brush cutters look more or less similar to monofilament line trimmers. They however, use a blade instead of a nylon string to cut grass and weeds. Metal blade present in brush cutter is effective in cutting down a stem four inches thick. The blades of the brush cutter rotate counterclockwise. Therefore, you use a swinging motion from right to left to cut grass. You have to be proficient to be able to use a brush cutter. The machine will kick back at you if you accidentally hit a thick stem from the wrong side. Stay away from using the brush cutter in a chopping motion, as it will stop the machine from functioning altogether. Wear a body harness with effective eye and ear protection while operating the machine as it might pose a risk owing to its prowess and heavy weight. Take adequate safety measures as it throws back the debris at you and can pose a threat to bystanders within a range of 50 feet. There is an age-old debate related to blade vs. string trimmers. The brush cutters require safety gear and body harness owing to their heavy weight. The brush cutters take less time to clean up a large yard with heavy foliage compared to their nylon string trimmer counterparts. The blades have capability to cut tall grass, thick bushes, shrubs, deep-rooted weeds, and even small trees. In short, blades are more effective and perform a plethora of functions when compared to string trimmers. However, there is a steep learning curve involved to operate brush cutters safely without causing damage to the machine or the operator. The string trimmer although portable, cannot handle large thick weeds and ends up turning small rocks that come in its way, into projectiles. The line in a string trimmer is vulnerable and may break easily. In conclusion, if you have a yard with light shrubbery or undergrowth, a string trimmer works very well. 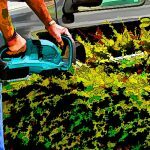 However if your yard has a very thick foliage with large weeds then brush cutters are your best bet.